I have been working with clay for over 20 years now and have loved every moment working with such a versatile and exciting material. I was first introduced to working with clay by my very inspiring secondary school teacher who encouraged me to use all the facilities available in a very well stocked ceramics studio (I was very lucky!). After my A levels I progressed on through the usual routes, first to an Art Foundation course and then on to BA(hons) 3D Design (Glass with ceramics) at the University of Sunderland. Whilst I enjoyed working with glass as a material my heart was still firmly with clay and I wanted to learn and push myself more. So it was on to a Master of Art (Ceramics) course at the University of Wales Institute, Cardiff. This was a fantastic two years of truly getting to grips with the material and starting on a path that I would follow for many years to come. Alongside making I started teaching in an FE college, a role that grew and grew over the years culminating in being promoted to Curriculum Leader for Art, Design and Media for 16-19 year olds. A few years ago I realised that as much as I loved teaching, I wanted to move from working in a college and get back to being creative, so I decided to take voluntary redundancy. Whilst I had the chance I went on a round the world adventure with my bloke for four months which proved to be one of the most exciting and inspiring things I have ever done. I used my photographs as a starting point for designing and making, and launched my ceramic business in November 2013. 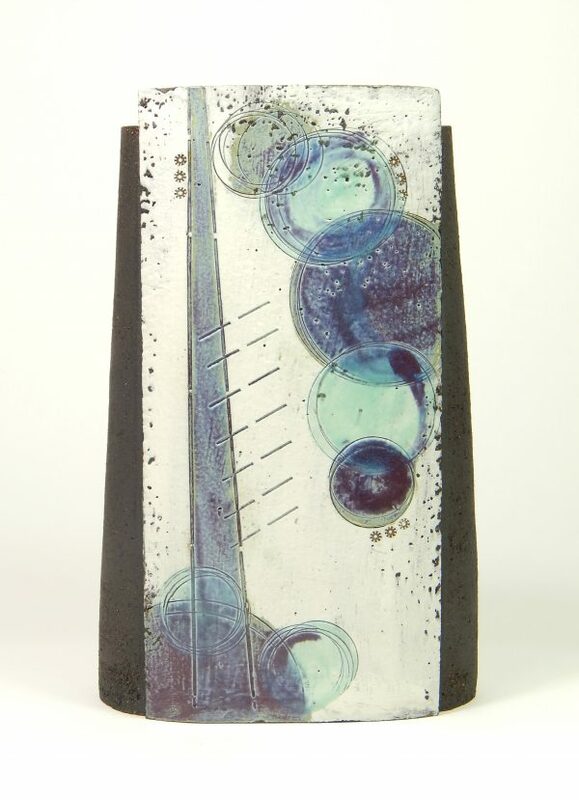 I am based in Lancashire and in my studio I create contemporary ceramic vessels and handmade ceramic jewellery. The vessels are decorated with slips before being impressed with marks which are inspired by photographs taken whilst travelling extensively. I use splashes of colour to highlight the texture and mark making before firing to stoneware. Each piece is unique and is slab built with textured or chunky black clay and are, for me, a celebration of form, material and mark making. They will happily hold water if required. My jewellery is created from black vulcan clay or high fired porcelain which are both strong and durable in order to give two distinct ranges. The clay is impressed before being decorated with oxides, slips and glazes. The marks made on my work are created with man-made objects such as screws and nails found on the street, or from parts of circuit boards salvaged from abandoned electrical goods. This way of impressing marks into clay is a reflection of my long-held fascination with the concept of future fossils and how the throw away nature of modern life affects the land.